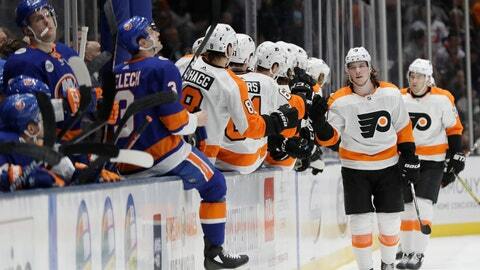 UNIONDALE, N.Y. (AP) — With the season coming down to the wire, the Philadelphia Flyers know that wins over division-leading teams such as the Islanders are not easy to come by. Well, now they’ve got two over New York in the last six days. Ryan Hartman, Sean Couturier, Nolan Patrick and Travis Konecny also scored for Philadelphia, which had a three-goal second period. Brian Elliott made 25 saves for his 10th victory of the season. Elliott’s performance was also bolstered by the 16 blocked shots the Flyers recorded. Scott Mayfield and Nick Leddy scored for New York, and Thomas Greiss made 10 saves but gave up all five of the Flyers’ goals in 39:56 of action. Christopher Gibson made his first appearance since Dec. 6 in relief of Greiss in the third period and stopped 10 shots. The Islanders remained two points behind Washington for the Metropolitan Division lead. New York has struggled in its last five games, going 2-3-0 since defeating the Toronto Maple Leafs 6-1 on Feb. 28. New York’s only two wins came against the struggling Ottawa Senators. The Islanders host Columbus on Monday night. “It’s not something we’re taking lightly,” Islanders captain Anders Lee said. “When there’s a rough patch and we’re coming in here talking a little bit too much about the streak. We just have to find a way to regroup tomorrow. We have a huge (game) on Monday. The Flyers made it 4-1 when Patrick scored at 5:35 of the second. Konecny’s goal at 17:26 put Philadelphia up 5-1. Leddy scored to cut the Flyers’ lead to 5-2 with 3:32 remaining in the game. Mayfield gave the Islanders a 1-0 lead at the 6:30 mark of the first period after his shot was deflected into the net by the stick of Corban Knight. The goal was Mayfield’s first since Nov. 18 against Dallas. The Flyers evened the score on Hartman’s goal at 15:20 of the first. Ivan Provorov threw the puck at the net and Hartman was able to push the rebound by Greiss. The Islanders honored their late Hall of Fame general manager Bill Torrey before the start of the game. Members of Torrey’s family were on hand for a ceremonial puck drop and a tribute video was played in his honor. NOTES: Flyers G Carter Hart missed his sixth straight game. Flyers coach Scott Gordon told reporters that Hart was healthy. The Flyers goaltender missed the previous five games with a lower-body injury. … Islanders F Cal Clutterbuck missed his third consecutive game with an upper-body injury. Clutterbuck was injured last Sunday in the Islanders’ 4-1 loss to Philadelphia. … The Flyers made their second appearance of the season at the Nassau Coliseum on Saturday. Philadelphia has played four regular-season or preseason games against the Islanders at the Nassau Coliseum since the building was reopened in 2017, the most for any team in the NHL. … The Islanders scratched D Thomas Hickey, D Luca Sbisa, D Dennis Seidenberg, F Andrew Ladd and F Ross Johnston. … The Flyers scratched D Samuel Morin and D Andrew MacDonald.